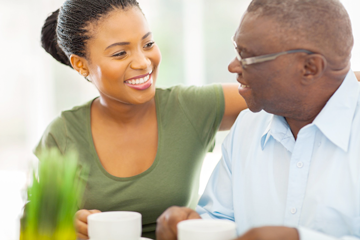 It can be hard to talk to a family member or friend about making healthy lifestyle changes. Use these tips to start a conversation about heart-healthy changes like quitting smoking or getting more physical activity. Begin by saying that you care. Explain that it’s possible to prevent heart disease. Eat healthy. Get plenty of fruits, vegetables, whole grains, and fat-free or low-fat dairy products. Limit saturated and trans fats, added sugars, and sodium (salt). Get active. Aim for 2 hours and 30 minutes of moderate aerobic activity every week. Stay at a healthy weight. If you are overweight or obese, losing just 10 pounds can lower your risk of heart disease. Go shopping together for heart-healthy foods. Then cook and enjoy a healthy meal. If your loved one smokes, encourage him to get free help quitting by calling 1-800-QUIT-NOW (1-800-784-8669).